Adobo dish usually use pork or chicken and maybe because those meat are readily available compared to beef or goat meat (and more expensive too). The only disadvantage on cooking goat meat specially in an adobo dish is the odor. So there are some extra procedure on cooking adobong kambing. 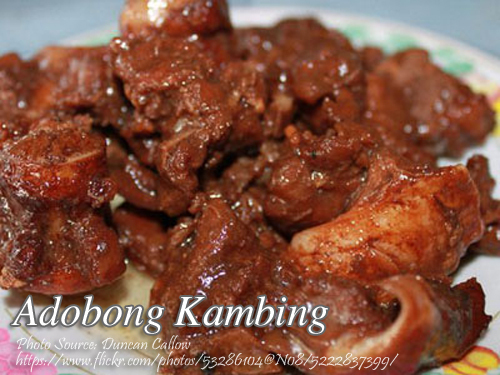 To cook adobong kambing; Boil the goat meat with ginger to remove the goat odor. Then cook the goat meat until tender but not too much because it will be fried later. Remove the meat from the pot and deep fry for 10 minutes. Darin and transfer the meat on a bowl and set aside. In an empty pot, put soy sauce, vinegar, water, pepper and shredded garlic and simmer with the fried goat meat until tender. Remove the goat meat again and place in a bowl. Set aside the soy sauce, vinegar and garlic mixture where you cooked the goat meat. In a pan saute garlic and put the goat meat and stir-fry for a few minutes then pour a little bit of the soy sauce, vinegar and garlic mixture. Add the shredded chili peppers and onion, laurel leaves and simmer until the liquid has evaporated and the sauce becomes very thick. Boil the goat meat with ginger to remove the goat odor. Then cook the goat meat until tender but not too much because it will be fried later. Remove the meat from the pot and deep fry for 10 minutes. Darin and transfer the meat on a bowl and set aside. In an empty pot, put soy sauce, vinegar, water, pepper and shredded garlic and simmer with the fried goat meat until tender. Remove the goat meat again and place in a bowl. Set aside the soy sauce, vinegar and garlic mixture where you cooked the goat meat. In a pan saute garlic and put the goat meat and stir-fry for a few minutes then pour a little bit of the soy sauce, vinegar and garlic mixture. Add the shredded chili peppers and onion, laurel leaves and simmer until the liquid has evaporated and the sauce becomes very thick.